How are you doing with your writing goals? Don't lose your determination to get that story or book out of your head and onto the paper. "Many writers struggle with finding time to write, maintaining their motivation, or keeping that pesky inner critic at bay," said Gabriella Pereira at DIY MFA. 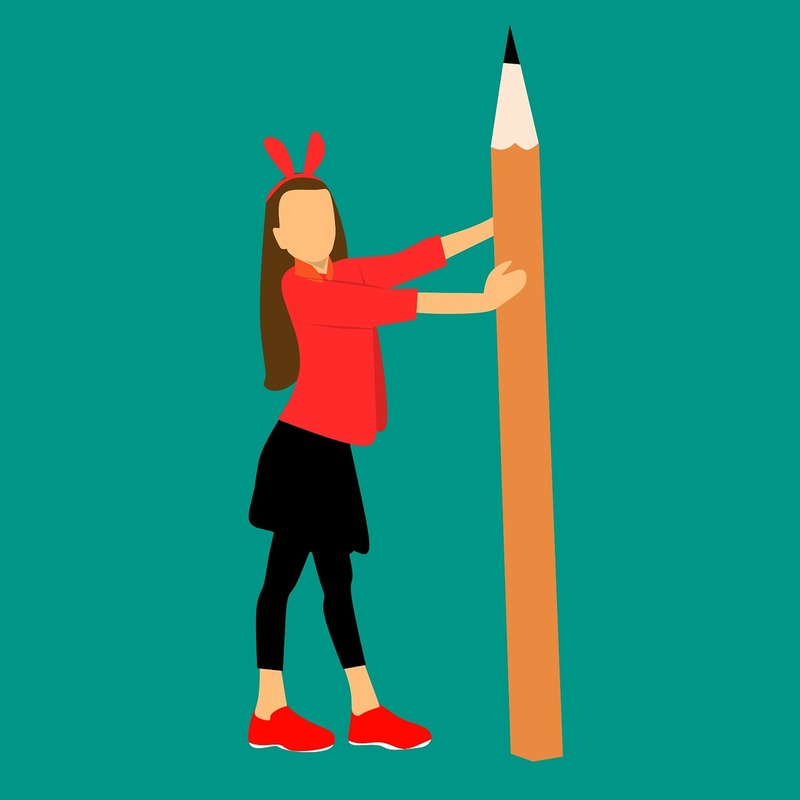 She has a plan for smacking down those obstacles by helping writers build writing momentum and bust through mental blocks that are getting in your way. She is launching a new program called the DIY MFA Book Club Challenge. Click here for more information about the Do-It-Yourself Master of Fine Arts Book Club. I decided to be more proactive in my writing process and join the challenge. How about you? I'll be sharing some of my writing prompts Gabriela gives us during the month. Here's the first one. Prompt: How did you become a writer? I became a writer when I was in second grade in order to stay out of trouble. I was an innocent player in an unusual situation during my second grade year in my small town grade school. Our second and third grade classes were filled with more kids than usual, hence the term “baby boomers.” Not quite enough kids in each class to hire two teachers, so the school decided to have a combined class of second and third grades in one classroom. And who was the lucky teacher assigned to handle this double workload? My mother. Yes, I had my mother as my second-grade teacher. Talk about a predicament for both of us. I was always aware of my "special standing" in the class. Did the kids treat me differently because our teacher was my mother? Perhaps at times, but I never felt it caused a problem with friends. Do I call mom Mrs.or just Mom? Actually, I didn't address her at all during school time. Could I hug her when leaving for recess? No, I didn't do that, but plenty of hugs after school. In fact, my mother and I had a special relationship which I cherish to this day. I don't know if being her student for nine months may have contributed to our closeness as I forged through my teens and beyond. Many years later, after I was married and had my two daughters, Mom told me how difficult that year was for her. She never graded my tests, but instead opted for having the other second-grade teacher do it. She didn’t want anyone to think she was giving me A’s because I was her daughter. She was stricter with me than with the other kids in the classroom for fear of being accused of favoring me. She struggled all year to find a balance between being my mother and being my teacher. As a 7-year-old I had no idea. I admit I was one of those kids who loved to talk to students sitting near me so I would get in trouble a lot for doing that. In order not to invoke the wrath of my mother on me, I learned I had to keep busy so I wouldn’t talk to my classmates when I finished my assignments. Since I was always done earlier than anyone else, I decided to write stories. I remember scrawling those stories, mostly about animals, on a tablet (way before electronic tablets were available) using a #2 lead pencil. I wrote so many stories, I developed a “writer’s bump” on the middle finger of my right hand. I still have it. Not only did I love creating those tales using my 7-year-old-experiences as a starting point, I especially loved reading the stories to my class and watching them smile and laugh because of what I wrote. Seeing their enjoyment hooked me so I continued to make up stories and still do to this day! Are you a writer? When did you begin? How ARE you doing with those 2018 writing plans? Are you a reader? When did you fall in love with reading? Please leave a comment below. We'd love to hear your experiences. Join us for book giveaways, prizes, mysteries, and fun! 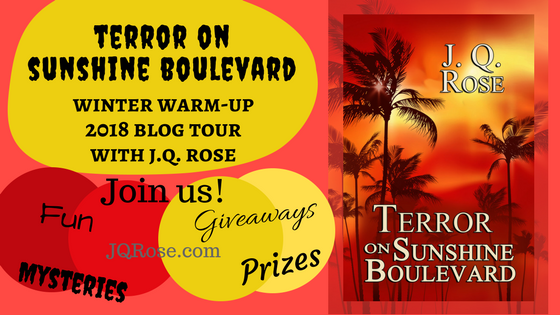 Excited to begin my Blog Tour for my newly-released paranormal mystery, Terror on Sunshine Boulevard. Author Sandra Cox kicks off the tour on Monday where I share tips on arranging cut flowers. (In case you didn't know, I was in the flower business with GT for 20 years.) Thank you, Sandra, for hosting my first stop! Then I pop over to my critique buddy's amazing blog, Heartwood, on Wednesday where I answer questions Nan Pokerwinski has cooked up. Please join us. Just click on the blog name and go to have fun and win prizes!! Nan Pokerwinski Heartwood Blog - a blog about cultivating creativity, connection and contentment wherever you are. Apologies to those who have had a hard time commenting on this blog. I discovered when I revamped the blog, I added to share my posts to G+. I just discovered that means people without a Google account can't comment. So I switched it back to not sharing to G+, therefore the comments made previously do not show up. Hopefully next blog on Monday everyone will be able to leave a comment Google member or not. Hi JQ, I was just going to write to Sandra and tell her to leave a comment on your blog, because I couldn't. I thought I would come back to your blog one more time and I am so happy I did, because now I can! Thankyou for switching! Also, thank you for coming to visit my blog! Very kind of you! Nice to meet you! That is such an interesting story, having your mom for a teacher. How you started to write and how she didn't want to treat you special! Keeping yourself motivated, I guess it's like me and my art. I always say, if you are having to push it stop! It has to come deep within you. Have a great day! Big Hugs! Hmm, I left a comment earlier but I don't see it. Google must have ate it:) Any hoo, I enjoyed getting to learn more about you. Sounds like you and your mom shared a special relationship. Hope your weekend is pleasant and productive. Hi MagicCrowLove, so glad you returned to the blog. Thank you. Glad you enjoyed the story. Enjoy a relaxing Sunday. Hi Sandra, Yes, you left a comment earlier, but when I changed from G+ posts, I lost all the comments. Thank you for coming back to comment again. I am thankful for having that year with her now when I can appreciate how difficult it must have been for her. Looking forward to seeing you on Monday!! Hey, JQ. I love your story of how you first learned to love writing. I was the parent cheer leading sponsor for one of my daughters one year, when we couldn't find a staff person to do the job. It was difficult to not favor my daughter, who was really very good. So I get your mother's feelings about the situation of being your teacher. Thanks for sharing. Hi Marsha, just came across your comment. Sorry I missed it over 4 months ago! I appreciate how you identify with my mom's feelings. I know when I was my daughter's Brownie Scout leader one year how difficult it was for me not to treat her differently from the other girls.